NACOGDOCHES, Texas - The estate of the late Nancy Delaney has funded two endowed scholarships for students in Stephen F. Austin State University's School of Art and College of Fine Arts. A portion of the funding came from a recent sale of Delaney's jewelry collection at The Cole Art Center @ The Old Opera House, SFA's downtown art gallery. Commercial Bank of Texas managed the estate and presented the scholarship funds to SFA representatives. 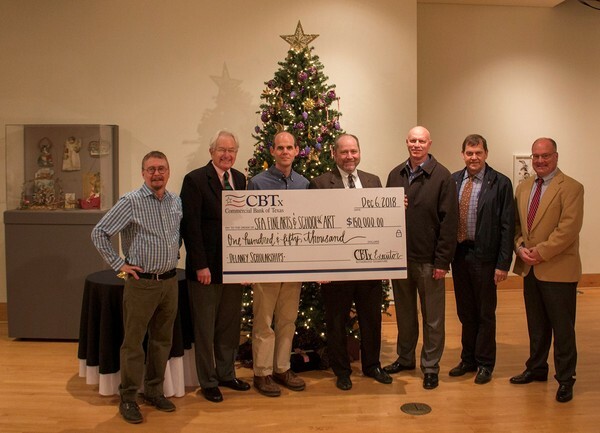 Pictured are, from left, John Handley, director of SFA art galleries; Dr. A.C. "Buddy" Himes, dean of the College of Fine Arts; Christopher Talbot, director of the School of Art; Drew Knowles, CBTx general counsel; Rusty Rust, CBTx CEO; David Shofner, CBTx wealth management and trust officer; Jimmy Mize, CBTx executive vice president. The Creighton H. Delaney Endowed Scholarship is for a financially needy student in the School of Art, and the John N. Staley and Margaret Anderson Staley Endowed Scholarship is for a financially needy female student in the College of Fine Arts.